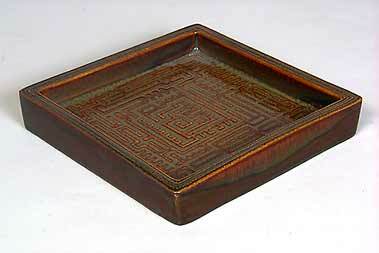 Brown Gustavsberg square dish - 6" (152 mm) square. This is from the Domino series and was designed by Stig Lindberg. Gustavsberg was set up outside Stockholm, Sweden in 1786. The firm had success in the nineteenth century making china in the style of English creamware. Around the beginning of the twentieth century the company started to produce pottery with floral patterns under the direction of G Wennerberg. Wilhelm Kåge, an artist and potter who studied under Henri Matisse, joined the company in 1917. He later became artistic director and took the company in a new direction. He is known for his stoneware and porcelain one-off pieces, his designs for tableware and his Farsta and Farstarust glazes - copper and iron oxide, respectively. Kåge stayed with Gustavsberg until 1949 when he was succeeded by Stig Lindberg who had been a designer there for some time. Lindberg was responsible for the experimental studio set up in 1942 to develop new designs for production.